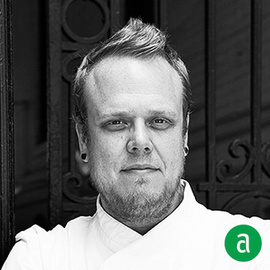 Anthony Chittum, Executive Chef and Partner of Iron Gate Restaurant in Washington, DC,shares his career timeline and words of advice for up-and-coming professionals. I hope that when a chef leaves, they have developed the proper technique and a sense of how to treat seasonal ingredients. Growing up, I would spend my nights at the dish pit, catching glimpses of the Chef. They had command and confidence in the kitchen, but also a rebellious, almost rock star quality that was attractive to a teenage kid. My first prep cook position was making large batches of red sauce at Lucky Luciano's and I've never done anything else since. Chef Todd Grey at Equinox Restaurant taught me how to properly manage a staff, cook seasonally and forge relationships with local farmers. My time with Chef Donald Link taught me how to act in a professional kitchen and that there are endless possibilities in this industry.